In high school a friend of mine highly recommended to me Vader and Slayer, and the time neither impressed me. My young adolescent mind was so consumed with the shocking and appalling, and low guttural vocals were an absolute must. Lets pull the tape towards the present and now, Vader and Slayer (well until jeff hanneman died) are one of my favorite metal bands. 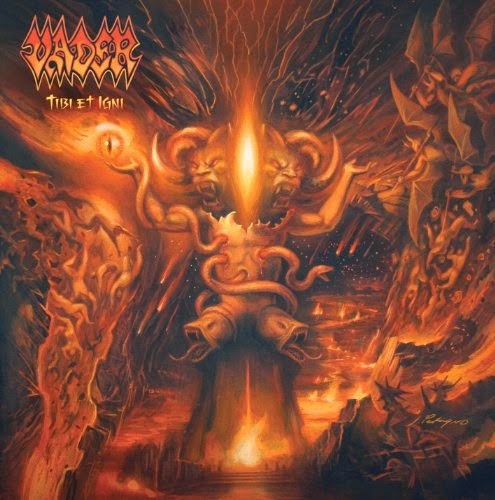 It’s with great honor to finally be able to hear Vader’s newest release titled “Tibi Et Igni”, the death metal powerhouse who show no kind of slowing down. This release has a lot of variety in its play style that doesn’t necessarily draw from pure death metal sound, but also incorporates some symphonic (very minimal), and musical passages that just remind you of a traditional heavy metal release. Melodic sound structure can be heard throughout, and leaving you entertained from start to finish. They have also cooperated with some female vocals that are on this release, but adds yet more diversity. The vocals are some of the best, as far as death metal is concerned, as they are easy to understand and they keep a consistent angrily driven force on the surface of the instrumentation. With the addition of bonus tracks it does become a bit lackluster, but it’s more of a quarrel with the attention span of myself. Because from start to finish this album is heavy metal laden death metal release which brings a breathe of fresh air to the genre, it has popularized. Least favorite track, “Przeklety Na Wieki (Cursed Eternally), which I guess you could call a ballad but it just feels way out of place for this record, but it being a bonus track no harm done. They mighty vader has put out a great contender for the 2014 metal releases.